On the 9 January, I was lucky enough to fly out to Holland to visit Willem Dijkstra's workshop in Sloten and see the progress of the cap restoration for the mill. Travelling alongside the chairman Dennis Coombs, Andrew Conway the photographer and millwright Paul Kemp, we flew from London Southend to Amsterdam. At Amsterdam airport we met milling heritage consultant Luke Bonwick, before being collected by Willem to venture an hour north-east of the city to Sloten. Cameron (right), with (from left to right) Luke, Paul and Willem. Upon entering the workshop, I was incredibly moved to see the skeleton of the mill's cap right in front of me on the ground. It was the first time I had seen the cap since I visited the mill as a child at the age of six or seven. The scale of the cap cannot be appreciated until it confronts you on the ground. Huge care has been taken to reconstruct it. A significant proportion of the timbers have had to be replaced due to excessive decay. 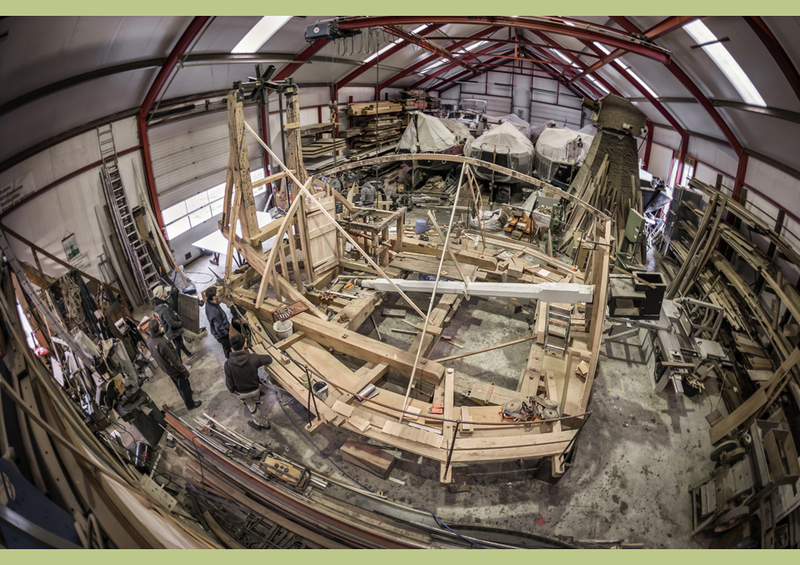 The cap-frame is now structurally sound and will enable the mill to work again, turning so that the sails face into the wind. It was exciting to hear that some historical timbers were able to be reused. The fly-posts, which hold up the fantail, were constructed from a stock which broke on the mill in the early 20th century. With minor repairs, they are able to be used again. Inauthentic details introduced as holding repairs are being corrected. During redecoration in the last half of the 20th century, the fanstage, reefing stage and cap gallery were incorrectly painted black. They will be returned to the same finish as when the Mill last worked in 1935. It was hugely inspirational to see the meticulous craftsmanship that had gone into the cap repairs. 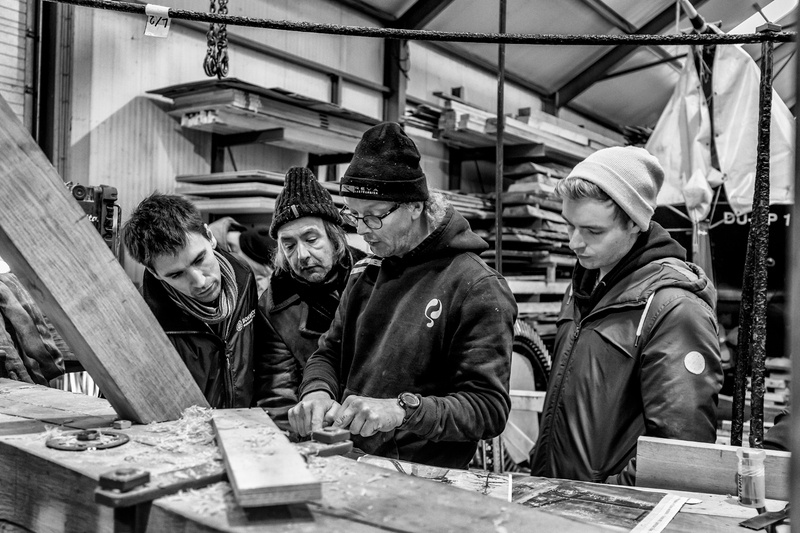 As an aspiring millwright myself, it has been fantastic to see all aspects of Willem's work. From constructing the smock frame at Upminster to following the journey of the cap repairs, the scale of this project is mind-blowing. 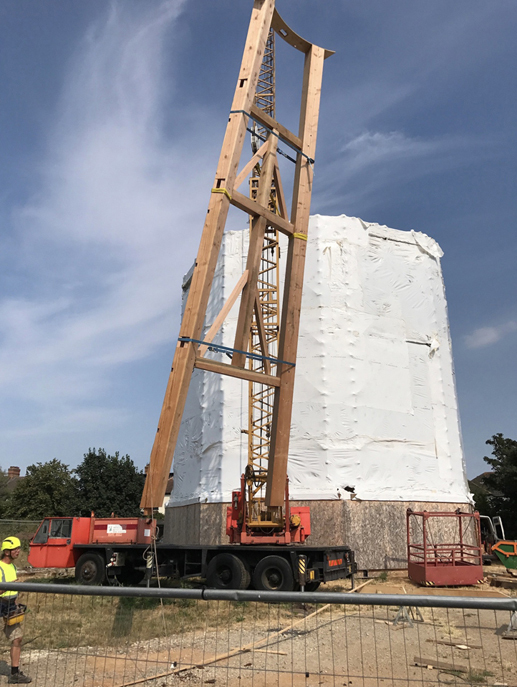 The logistics, planning, craftsmanship and the hours of labour by millwrights and volunteers combine to hold this as a pioneering project in windmill conservation. It is almost certainly the greatest restoration of a smock mill to have been undertaken in this country and probably elsewhere. Hopefully the work will inspire many more. I feel incredibly lucky to have been able to visit Willem's workshop in Holland, and to be involved with the restoration project of Upminster Windmill as a whole. From visiting the mill as a small child to getting involved as a young adult, Upminster has and will always be a special mill to me. I would like to thank the amazing team at Upminster for all I have learned so far, and all of the opportunities this project has presented. I am itching to see how the works progress throughout this year and can't wait for it to be enjoyed by visitors. Reproduced here with the kind permission of Luke Bonwick. 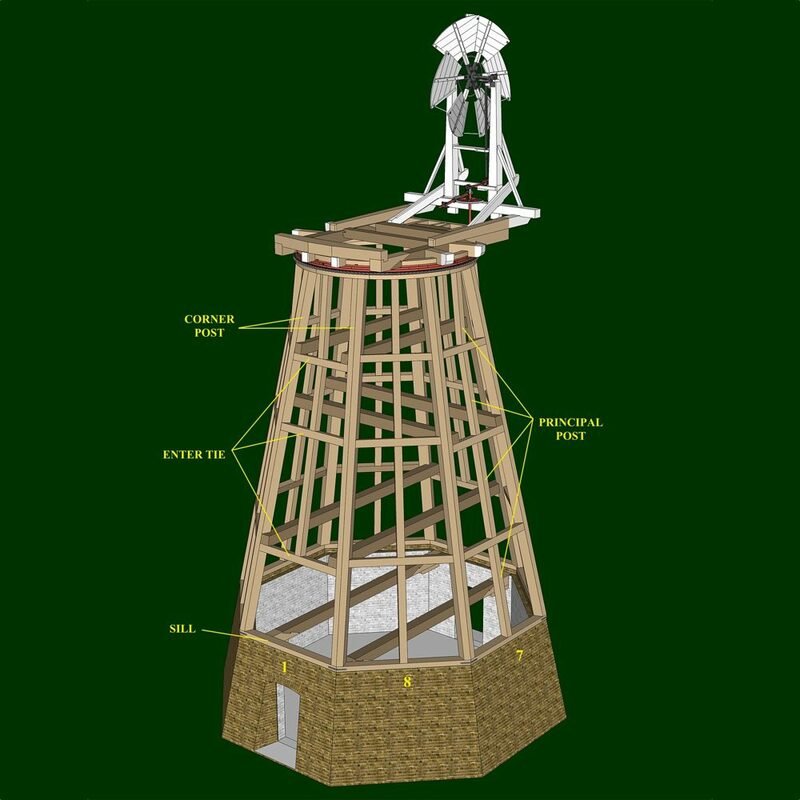 One of the most comprehensive repair projects ever undertaken to a smock windmill in the UK. Built in 1803, Upminster Windmill is one of England's largest and most powerful smock mills. It is listed Grade II* and is owned by the London Borough of Havering. The mill is managed by the Friends of Upminster Windmill who, in partnership with the Council, were successful in obtaining grant aid from the Heritage Lottery Fund and the Veolia Thames Trust to fully restore the windmill to working order and to build a brand new visitor centre alongside it. Bonwick HC specified the conservation and repair works to the mill's timber frame, its brick base and the mechanical elements from sails to millstones and auxiliary machinery. We are co-managing the repair project which is being administered by Rees Bolter Architects. The repair works are being undertaken by a Dutch millwrighting firm, Bouw Molens & Techniek Bertus Dijkstra. Its proprietor, Willem Dijkstra, is a millwright and engineer with experience in conserving a wide range of heritage structures from church spires to mechanical wind engines for land drainage. Willem has recently restored another English-style windmill which was exported to Jerusalem in the mid-19th century by millwrights from Kent. The cap roof of Upminster Mill, its sails and upper gearing have made their way through the channel tunnel to Bertus Dijkstra's workshops in Sloten, Friesland. These will gradually be re-assembled on site during the latter part of 2018. The project is due to be completed in 2019 and the mill will officially re-open in 2020. The internal machinery of Upminster Mill is mainly constructed of timber. It represents the 'wooden engineering' of the early 19th century, before the widespread adoption of cast iron gearing and mechanical parts. Luke Bonwick’s website is well worth a visit. There you can see the original of this article along with the splendid set of accompanying images.